Set in the not too distant future, the people of the city of Metropolis are divided into two. The thinkers or upper class live in the cities towering sky scrapers and blossoming streets, and the workers or lower class, have a slavish lifestyle, dwelling in the cities under belly keeping the machines running. The sets, miniatures and cell paintings are outstanding, the art-deco inspired skyscrapers are remarkably detailed right down to the busy hustle of the adjoining motorways and planes zooming between buildings. 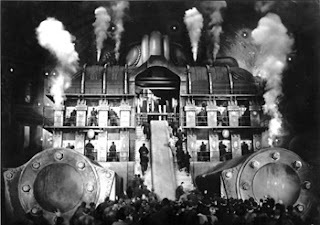 In stark contrast, the lower levels are dark and gloomy, with huge mechanical set pieces and monotonous workers. 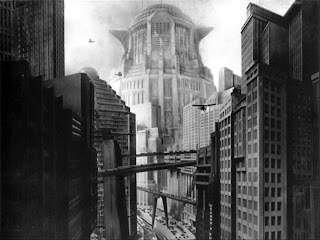 The scale of this movie would be impressive even by todays standards, let alone in 1927. "With its immense sets and stark lighting, the workers' city is a credible image of hell, while the overground landscapes were a seminal influence on all subsequent science fiction." 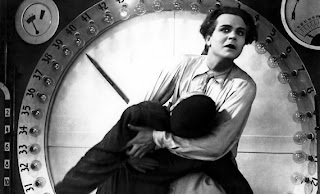 The protagonist of the movie comes in the form of Freder, the son of the mastermind of Metropolis, Joh Frederson. Freder is ignorant to the inner workings of the city, living in paradise like gardens, surrounded by women and wealth. One day, Marie, a prophet of some sorts enters the gardens with poverty stricken children, claiming they are the brothers of the wealthy. Freder is captivated by her following as she is forcibly removed. 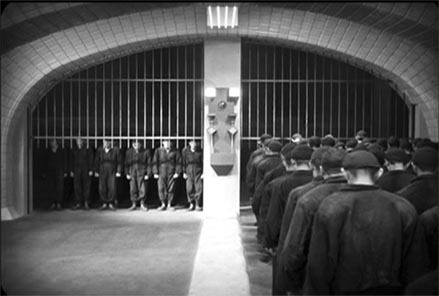 He then discovers first hand the horrible conditions the workers suffer. Freder pleas to his father who snobbishly dismisses him and subsequently has Freder followed by "The Thin Man" to keep an eye on him. Meanwhile, Joh seeks the help of another mastermind of metropolis, Rotwang the inventor, who we discover was in love with Joh's wife and Freder's mother. He show's off his new invention, a robot who has built in the image of his deceased love. Freder goes in search of Marie after switching costumes with a common worker. Marie preaches to the workers that they will be saved by a "mediator" who comes from the thinkers. The message throughout the film "between the brain and the hands is the heart" is personified by Freder. 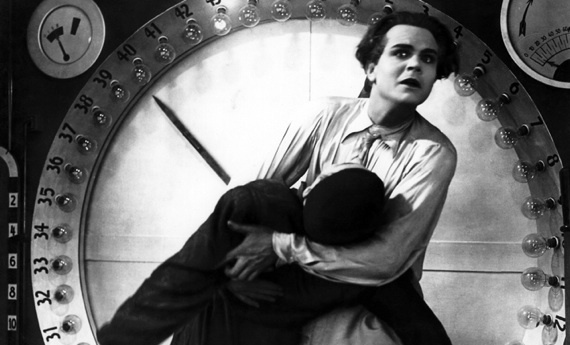 Joh Freder convinces Rotwang to use his robot in the form of Marie to try and cull the uprising of the workers. Rotwang instead uses the robot to lead a resistance against the rich and the powerful. The city falls into chaos with the machines exploding and the streets flooding with water. Freder and Marie save the trapped children from drowning and the workers burn the robot in the guise of Marie. Rotwang also meets his demise by the hands of Freder, falling from one of the sky scrapers. "On Jan. 10, 1927, Fritz Lang's ''Metropolis,'' a wildly ambitious, hugely expensive science fiction allegory of filial revolt, romantic love, alienated labor and dehumanizing technology opened at the Ufa Palast theater in Berlin. Lang's film, of course, went on to become one of the touchstones of 20th-century cinema, exhaustively studied and endlessly imitated, but apart from its brief theatrical run in Berlin and Nuremberg 75 years ago, the movie as Lang made it has never really been seen." I extremely enjoyed this movie even though it is another silent film, the visuals more than make up for the lack of dialogue. It is a technical triumph and no doubt the inspiration for many science fiction, fantasy films since. 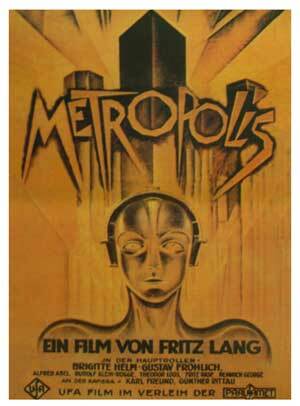 It tackles strong subjects from class segregation to feminist issues and is a landmark in German expressionism. "Stanley Kubrick, Ridley Scott, George Lucas and other socially concerned artists imagining the future are indebted to Lang"